The Navdy connects via Bluetooth to your smartphone, displaying info like maps, music, texts and calls onto a transparent screen that appears to float in front of you. Want all the latest tech features without buying a new car? You can have them, and it’s easier and more affordable than you think. If you’ve always wanted built-in Bluetooth or safety features like lane assist and low-tire warnings, you don’t need to wait until it’s time to trade in your ride. With devices that let you start your car remotely or figure out what the “check engine light” really means, you can add high-tech features to your old-school car. You can get a good quality windshield-mounted HD video Dash Cam for under $200. The Garmin Dash Cam 55 offers voice control and some additional safety features. When sensors detect impact, it immediately saves the current and last video clip which you can wirelessly sync to an app on your smartphone so you can share it if needed. You can ask it to snap a picture or record video by saying “OK Garmin,” followed by the command. Video is recorded in a continuous loop onto a built-in microSD card and includes a time stamp with date and location so you know exactly where an event took place. If you’re a fan of those lane departure warnings in newer cars, you’ll like the Garmin’s built-in safety features. You’ll get an alert if you’re too close to the car ahead or if you start to drift out of your lane while driving. If you’re still hitting the road with a Bluetooth headset in your ear, or worse, holding the phone in your hand, connect to the JBL Trip and you’ll never get a ticket for talking while driving. The small, portable Bluetooth speaker adds Bluetooth functionality to your car, letting you take and make calls and listen to your music hands free. It has Voice Cancellation technology so your calls are clear, without any of the wind and traffic noise coming through. It clips to the visor so it’s always within reach, and since it works with Siri and Google Now, you can simply ask it to call home for you. You’ll also get turn-by-turn driving instructions from navigation apps right through the speaker. We love that you can take the portable Trip with you in a rental car on vacation, then bring it into the hotel room to stream your music. The JBL Trip adds Bluetooth functionality to your car, letting you take and make calls and listen to your music hands free. If it’s just you and the car radio on that road trip, you can still stream your phone’s music through the car’s speakers. Anker’s Roav SmartCharge F2 is an FM radio transmitter that adds Bluetooth functionality to older cars. Plug it into the cigarette lighter, find an open station using the smartphone app, and start streaming. The SmartCharge also lets you make hands-free calls and has two USB ports for charging your devices. We love the bonus feature Anker built in; use the app to set a parking timer and it will guide you back to your car in a crowded parking lot. Newer cars have built-in capability to call for help in the event of a crash or emergency, and remind you when maintenance is required. Older cars, built after 1996, can now get that smart car functionality with Autobrain, a small device that plugs into the car’s on-board diagnostics port, usually located under the steering wheel. For a monthly subscription of about $9, you get roadside assistance coverage (for towing, flat tire, dead battery, etc.) as well as automatic emergency response help in a crash. The device recognizes there’s been a crash and Autobrain relays your GPS location to a 911 dispatcher. Aside from the safety features, Autobrain offers peace of mind to parents of teen drivers. Using the app, you get real-time updates on the car’s location, speed, and driving performance. Much to the chagrin of teens everywhere, parents can also set up geofences so they know if their teen driver has strayed out of town. If you use these features, we recommend letting your teen know they’re activated. Having a conversation about safety features and trust is always better than being accused of snooping. Undetected low tire pressure can lead to poor fuel economy and maybe even an ill-timed flat tire. The Zus Smart Tire Safety Monitor brings high-tech monitoring to low tire pressure with an early warning of slow leaks. The aftermarket system comes with four Bluetooth-enabled valve caps, a receiver and a smartphone app. Sensors in the valve caps send the tire pressure and temperature info to the receiver, which you monitor in the app. If there’s an issue, it will send an alert. Zus also makes a Smart Car Finder that plugs into the car’s cigarette lighter port and sends the last known parking location to the Zus app. With the Zus Smart Tire Safety Monitor, sensors in the valve caps send the tire pressure and temperature info to the receiver, which you monitor in the app. Head-up displays (HUD) are the newest tech/safety features appearing in late model cars. The idea is to eliminate distractions, like taking your eyes off the road to look at a map on your phone, by displaying that important info directly in your line of sight. There are aftermarket HUD’s that add this futuristic feature to your older car by projecting a display onto a dedicated screen or glass display. 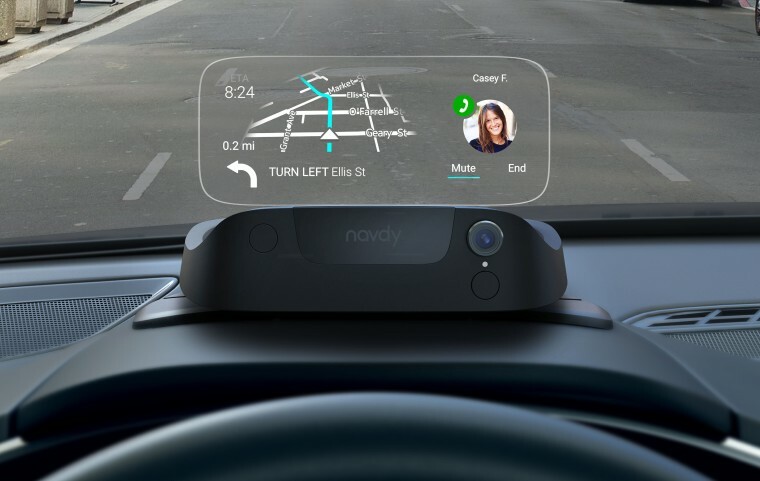 Navdy ($499) is a small device that attaches to the car’s dashboard and connects via Bluetooth to your smartphone, displaying info like maps, music, texts and calls onto a transparent screen. You’ll see everything in full color, just like on your phone, only it will be directly in your line of sight. And since the screen is transparent, the info looks like it’s floating in front of you. Navdy requires a bit of set-up with cables and wires, but once adjusted you’ll see your nav maps, view calls and text messages and control music without ever taking your eyes off the road. The Hudly Head-Up Display is a less expensive option, at $299, though it works slightly differently from the Navdy. A projector displays images onto a curved glass display on the windshield, mirroring what’s on your iPhone or Android phone. You can access all your apps on the windshield in front of you, and use hands-free voice controls while driving. It also displays vehicle statistics such as car speed and a fuel gauge. No nav? No problem. The Hudly Head-Up Display projects images onto a curved glass display on the windshield, mirroring what’s on your iPhone or Android phone. Our favorite way to make a dumb car smart is by adding a remote ignition system so you can start and warm up your car on a freezing cold day without ever leaving your house. Sure, those newer cars have a remote for keyless entry, but Viper SmartStart offers a range of aftermarket systems that do much more, though they do have to be professionally installed by a dealer. For a few hundred dollars, you can install a module that starts, locks and unlocks, tracks, and locates your car through a smartphone app. You’ll also get low battery alerts, speed and boundary notifications, and other diagnostic info. You’ll need a yearly subscription if you want to use the app from virtually anywhere but if all you need is about 100-foot range, there’s a new module with built-in Bluetooth coming out that doesn’t require a yearly plan. If you’re looking for a way to connect to the cloud while you drive — passengers only, of course — the major wireless carriers offer a plug-in device that makes an older car a connected car. They all collect vehicle information like the car’s location, vehicle diagnostics, and maintenance reminders and send it to an app. The device pricing varies and of course, they require a subscription plan and a data plan, but you can tap into your phone’s data bucket if you’re an existing wireless customer. Verizon offers HumX which adds 4G LTE connectivity and acts as a hotspot so up to 10 devices can connect: Great when you’re on a long road trip and the kids want to stream videos in the back seat. It comes with a Bluetooth speaker you attach to the sun visor for hands-free calls, and the app provides info such as top speed, distance traveled, mileage, and of course, the ability to find your car. Verizon also offers speed and boundary alerts, 24/7 emergency roadside assistance, crash detection, and the ability to call a mechanic and ask a question. SyncUP Drive from T-Mobileturns the car into a Wi-Fi hotspot so up to five passengers can stream their music and videos all the way to Grandma’s. Using the app, you can set speed alerts, track the car’s location, and monitor driving behavior. With your mobile internet data plan, SyncUP offers Allstate Motor Club roadside assistance for emergencies like flat tires, lockouts, and dead batteries. Andrea Smith is an award-winning news and technology journalist. She spent over two decades as technology producer at ABC News and was Lifestyle Channel Editor at Mashable. Andrea writes about consumer tech for several major lifestyle sites and publications. Andrea is also co-host of the Parenting Bytes Podcast, which can be found in iTunes. Andrea currently appears as a guest expert in technology segments for WABC TV, CNBC and Fox News, and has appeared on ABC’s World News Now, Good Morning America Now, and ABC-affiliated radio and TV stations across the U.S. Andrea also enjoys mentoring young women starting out in the business world and is a recipient of the 2015 Women in CE Legacy Award.